Polling for Senate seats was suspended Thursday in assemblies of Khyber Pakhtunkhwa and Punjab amid allegations of rigging. Pakistan Peoples Party (PPP) leader and former MPA Raja Riaz spoke to media, alleging that ballot papers were being forcibly stamped in Punjab Assembly while MPAs from PPP and Jamiat Ulema-e-Islam-Fazl (JUI-F) in KP alleged that Pakistan Tehreek-e-Insaf lawmakers had instructions to take the ballot papers out of the assembly’s premises, to the Chief Minister House to mark the ballot paper according to the wishes of the top PTI leadership. Chief Election Commissioner (CEC) Justice (retd) Sardar Mohammad Raza Khanook notice of rigging allegations and said that if Raja Riaz has any evidence it should be presented to the Election Commission of Pakistan (ECP). A request by the Returning Officers (ROs) was submitted to the ECP, asking to postpone the polling for FATA Senate seats following protest by FATA lawmakers on the late night ordinance promulgated by President Mamnoon Hussain. A presidential ordinance was issued late Wednesday under which MNAs from FATA have been entitled to cast only one vote. The previous presidential ordinance of 2002, that allowed four votes to each FATA members was withdrawn. “Tribal people reject the attempt of horse trading in Senate. We refuse this ordinance that was issued overnight unlawfully … This is a joke with people of FATA,” said PPP leader from FATA, Syed Akhunzada Chattan, while speaking to media persons outside the Parliament House. He also claimed that ruling PML-N got the ordinance issued to get their senators elected from FATA and demanded of the ECP to take notice of the ordinance. Polling began earlier today in the National Assembly and all four provincial assemblies for 48 seats of Senate. Polling is scheduled to continue till 4pm in the assemblies where legislators will elect new senators, through secret balloting process, to replace those who retire on completion of their six-year term. According to Election Commission of Pakistan (ECP), there are a total of 131 candidates vying from across the country for representation in the Parliament’s Upper House. Four candidates from Sindh have already been elected unopposed. Meanwhile, media personnel; of both private and state-owned channels, were barred from entering the National and Khyber Pakhtunkhwa Assembly as part of security arrangements. Cameras installed for security purposes were also suspended. No one allowed to enter the assemblies is to carry any electronic devices, such as mobile phones. With stage set for the election of 52 new members of the Upper House of the Parliament today at the federal capital and four provincial assemblies, top political leadership seems clueless on the fate of their candidates as the lawmakers may violate party discipline amid claims of use of illicit money being used for horse-trading. The Balochistan and Khyber Pakhtunkhwa (KP) assemblies are going to elect 12 new members while Punjab and Sindh lawmakers will choose 11 new members each. The focus also remains on both the provincial assemblies where the lawmakers have vowed to vote for other candidates, providing impetus to the allegations of vote purchase by rich candidates. While Pakistan Tehreek-e-Insaf (PTI) Chairman Imran Khan, in a last ditch effort, addressed his party members of KP Assembly and warned them against flouting party discipline, Railways Minister Khwaja Saad Rafique had to return “empty handed” as most of the lawmakers he met with in Quetta refused to budge to what they called “the dictations from Islamabad”. 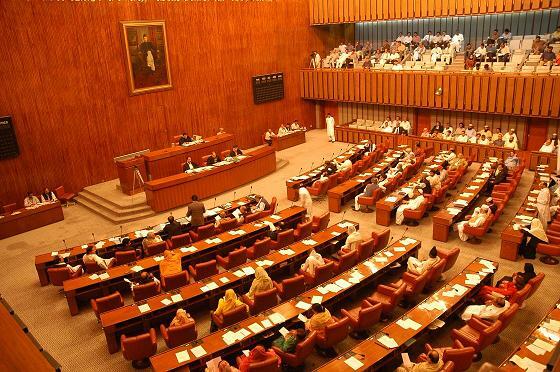 In clear violation of the party discipline, members of KP and Balochistan assemblies have proposed and seconded independent or other political parties’ nominees for the Senate elections. While PTI’s Javed Nasim and Wajihuz Zaman Khan of Pakistan Muslim League-Nawaz (PML-N) openly flouted party discipline by proposing or seconding candidates other than their parties in KP Assembly, at least seven members of the ruling PML-N proposed and seconded independent candidates for Senate elections in Balochistan Assembly. In KP Assembly, as per numerical strength of the political parties, the ruling PTI and its allies are likely to win seven senate slots while the opposition parties would easily clinch five slots. However, PTI rebels may also pull a surprise and either PPP’s wealthy candidate Noor Alam Khan or QWP’s Ammar Ahmed Khan may get elected. Elections in Balochsistan are ripe for many surprises and independent candidates are set to turn tables on PML-N leaders. Other than misuse of money, the independent candidates are also exploiting the Pashtun-Baloch divide among the lawmakers of Balochistan Assembly. A total of 65 members of Balochistan Assembly would cast their votes to elect representatives for the Upper House. As many as 32 candidates have been testing their muscles to achieve 12 Senate seats. At least seven members of the assembly have flouted their respective party discipline by either seconding or proposing independent candidates. Three members of PML-Q also proposed and seconded independent candidates while the two JUI-F and PML-N members did the same. A well-placed source claimed that the election of at least three candidates of the PML-N was in jeopardy. “There is a question mark on the election of Kalsoom Perveen, Yaqoob Khan Nasir and Shahbaz Durrani,” the source said, adding that despite efforts by Sardar Sanaullah Zehri, Baloch lawmakers were reluctant to vote for Shahbaz Durrani, Zehri’s brother in law, as he was a Pashtun. The source added that Yaqoob Khan Nasir was also facing a tough time for being a Pashtun. While around 10 MPAs of ruling PML-N had refused to meet Prime Minister Nawaz Sharif during his recent visit to the provincial capital two weeks back, Railways Minister Khwaja Saad Rafique also returned red-faced as the party lawmakers rebuffed his repeated requests and vowed to take an independent line per the tribal traditions. “Though Saad Rafique also tried to persuade the four lawmakers of PML-Q to follow the direction of the prime minister, the defiant lawmakers refused to follow dictation from Islamabad, telling Rafique they had already made commitment to various candidates and the PML-N had contacted them very late,” a source in the ruling PML-N told Pakistan Today. “The defiant lawmakers told Rafique they could not flout the Baloch traditions,” the source said, adding that even the lawmakers refused to meet Jaffer Khan Mandokhail, their parliamentary leader and provincial minister. The source added that Sardar Sanaullah Zehri was also no more interested in campaigning for the party candidates and he was focusing on seeking votes for his brother Nematullah Zehri and brother-in-law Shahbaz Durrani. The PML-N leader added that Sana Jamali, the daughter of Balochistan Assembly Speaker Jan Jamali, had also refused to withdraw her papers against Kalsoom Perveen. Jamali already has support of some PML-Q lawmakers while her two relatives are already members of the provincial assembly. The source said that due to the same reasons, Rafique had met with political leaders of five major political parties, including PML-N, JUI-F, National Party, PML-Q and Pashtunkhwa Milli Awami Party (PkMAP) and offered to enter into a seat adjustment to disallow any horse-trading bid. “However, PkMAP chief Mahmood Achakzai and JUI-F provincial chief Abdul Wasay refused to enter into seat adjustment,” the source said, adding that both leaders urged Rafique to convince Baloch lawmakers, as PkMAP and JUI-F lawmakers were all Pashtuns and were following their party discipline. Another source said that two JUI-F lawmakers had also proposed or seconded independent candidates which reflected the defiance was beyond ethnic lines. In Sindh Assembly, situation is under control and PPP and MQM are set to win seven and two more seats today. Both parties have already got two members each as one candidate each against seats reserved for woman and technocrats unopposed. However, a source in the PPP said that despite smooth sailing, the PPP leadership had requested MQM lawmakers to allocate some additional votes for Rehman Malik as some PPP lawmakers may not vote for Malik. In Punjab, the ruling PML-N is all set to win all the 11 Senate seats as the lawmakers of major opposition party, PTI, have already tendered resignations. PPP’s Nadeem Afzal Gondal may not pull a surprise as the ruling party has made foolproof arrangements to get its candidates through to Upper House. Despite the fact that the South Punjab lawmakers have strong reservations for being ignored, they lack courage to speak against what they call “the rule of Raiwind Palace”. In federal capital, the National Assembly members are all set to elect two “strangers” nominated by the ruling PML-N as both its nominees Iqbal Zafar Jhagra and Rahila Magsi are non-resident candidates of the capital city and petitions are pending with courts seeking their ineligibility without any decision yet.